My idea of a perfect summer day is sitting by the pool with my Kindle loaded with summer reads while sipping on an ice cold drink. That drink usually includes at least one of the two most refreshing ingredients: cucumber and mint. In most recipes, these ingredients are used one way, cucumber is a garnish and mint is muddled, but there are two different ways you can prepare these ingredients so they are drink-ready whenever you need them! Cucumbers have a very powerful taste, which is why they are often just a garnish instead of a main ingredient. I don't like using fruit as a garnish because you usually only use part of the fruit, and the part you don't use goes to waste. So instead of cutting a few slices of cucumber to drop into your drink and wrapping up the rest for later, you can make cucumber infused vodka and the cucumber taste will be poured straight into your drink! This recipe needs to sit for 1-2 weeks, so make it now and check back in the next few weeks on how to use you new infused treat. 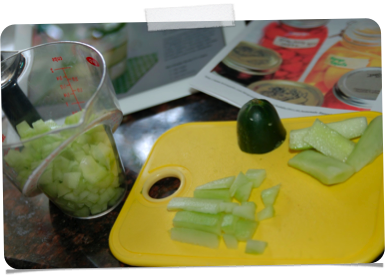 Slice your cucumbers (any way you'd like) and pour into a sterilized jar. Top the jar off with vodka and seal tightly. Store in a cool, dark place for two weeks, like a basement or back of the fridge. 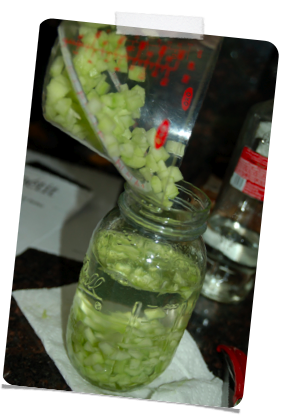 After two weeks, strain the contents of the jar, dispose of the cucumbers, and store vodka in the jar.